Jaques le Moyne accompanied Laudonniere on the second voyage of the French Huguenots to establish themselved in Florida (1564). The first expedition was two years earlier (1562). A small group of would be colonists had been left behind at the Charles fortress. Shortly after arrival the Spaniards attacked the new settlement. Le Moyne was among the few French survivors of the attack. On his return to Europe he first arrived in England where he stayed the rest of his life. Theodor de Bry went to London and eventually bought the original le Moyne drawings. The original of the map has since disappeared. 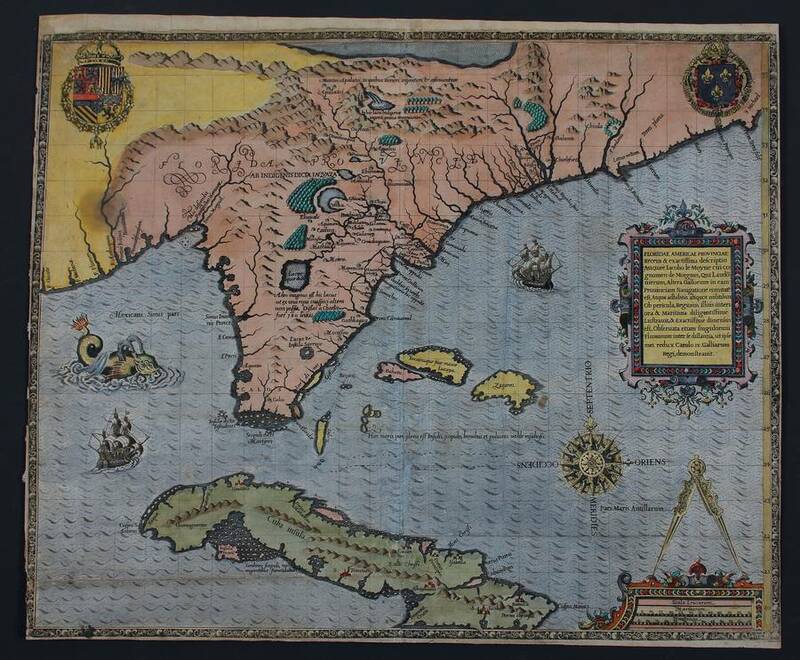 The map is a founding map in the cartography of Florida. It shows water at the northern border, representing Verazzanos concept of a small isthmus between the two oceans. Floridas interior carries the stories the Indians told the new colonists about the interior.